10 vehicle Mk 19 Grenade launchers in 1:48 scale. 10 vehicle TOW launchers in 1:48 scale. One American AAV7, Assault Amphibious Vehicle in 1:48 scale. One M2 or M3 Bradley in 1:48 scale. One Humvee, HMMWV, in 1:48 scale. One Humvee, HMMWV with GPK (gunner protection kit) turret and extra door armour in 1:48 scale. One Humvee with TOW missile carrier, HMMWV, in 1:48 scale. 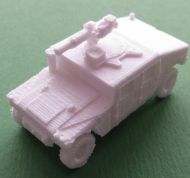 One Humvee with 50 cal HMG, HMMWV, in 1:48 scale. One Humvee with Mk 19 Grenade launcher, HMMWV, in 1:48 scale. One M38A1 Jeep (CJ-5, M606) circa 1950s to 1970s in 1:48 scale. One American LAV (Light armoured Vehicle) in 1:48 scale.